Until yesterday, I had a large plastic bin full of cables, and a duffel bag full of the cables that wouldn’t fit in the large plastic bin. 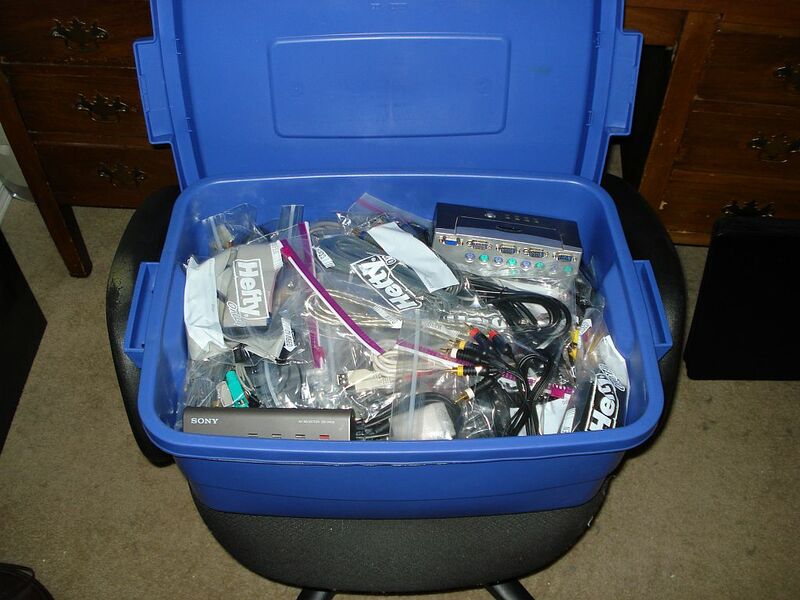 This is AFTER a major thinning project I did a while back, where I asked myself questions like “do I need to keep these half-dozen Commodore 64 drive cables?” and thinned it down from two huge plastic storage boxes to only the one bin and one bag of cables. In addition, the cables weren’t sorted or tied or anything, and as is their natural behavior they’d pretty much knotted themselves into two giant balls of wire. Two weekends ago, while my gamespouse was over, I needed to get out a single ethernet cable. The shame associated with upending these giant balls of wire onto the carpet and then having to unthread the single ethernet cable was… well, it was shameful. Really, that’s all you can say. Well, they’re still not really organized, but at least they can’t tangle. Also I got a bit more thinning done and managed to get it down to only the one bin of cables. In my other Big Win for Order, I found out that you can edit .ini files for both Thunderbird and Firefox to specify where they should store their data files – so, I tweaked them and now I can back my mail and my bookmarks up at the same time I back up all my other documents and source code and personal photos and so forth. For the first time in, I don’t know how long, if I lose a hard drive, I can calmly restore everything important from a single DVD-R.
Life is slightly more under control in ways that are of import only to geeks.